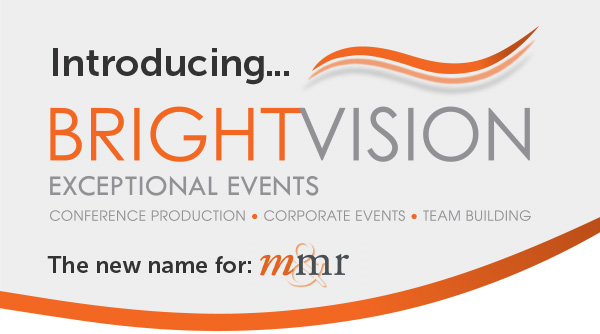 Bright Vision Events is the new name for M&MR. After 25 years of successful trading, we have rebranded to reflect how we have grown and evolved. We are still a specialist in corporate event management and continue to deliver exceptional live events to our clients. Over the years, however, we have added a wider range of services to our original core offering of conferences and team building, along with an ever greater emphasis on creativity and new ideas to satisfy our clients? requirements. We felt we needed a new name and Bright Vision Events it is, delivered with passion, expertise and creativity. Whether it?s Conferences, Exhibitions, Team Building, Activities, Evening Entertainment or Themed Events, we guarantee to deliver an event that will exceed your expectations. Click here to see some of our testimonials and contact us about the event you are planning. Contact us on 01295 770933 or enquiry@brightvisionevents.co.uk.